Thanks for signing up for the One Day Detox! Now that you’re on my list, you’ll receive special recipes, lifestyle tips or other insider news I don’t post on my general website. If you ever feel like unsubscribing, you can do that here. Go to bed early the night before— even ridiculously early if you can. Stay hydrated — with plenty of filtered water, and by eating foods that have a high water content (i.e. vegetables). Get some gentle to moderate exercise — walking up some hills out in the fresh air can work wonders. Eat extra veggies — the fiber and antioxidants will help flush toxins out of your body and help boost your immune system. Avoid — Refined carbs (flour products such as crackers, bread, etc — gluten free or otherwise), sugar, sweeteners, fried food, and alcohol. 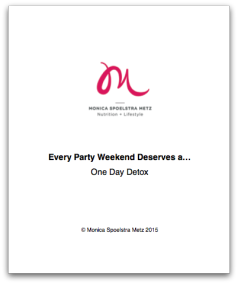 Please click here to download the One Day Detox.